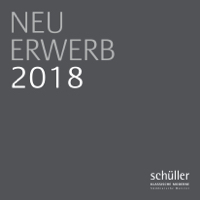 After our last complete catalogue, which was released five years ago, we are now presenting again masterpieces of classical modernism and southern German painting. At that time revolutionary and avant-garde, the stylistic plurality of the classical modernity enriched our gallery program for many years with outstanding works. We are particularly proud of the main works Dame mit Hut and Katholische Probsteikirche Sr. Patrokli, Soest by Karl Schmidt-Rottluff, which are available for the first time on the art market and which were recently honored with a solo show. However, we do not want to neglect southern German painting. These artworks exude nostalgic charm and complete our gallery program, especially as they are the heart and soul of our Munich gallery. The release of the general catalogue is an occasion for revised prices. These can be found in the enclosed price list or requested directly from us. We invite you exclusively for a private tour of the gallery, also outside the regular opening hours. Just call us or get in touch by e-mail. An extraordinary highlight in the program of our gallery are two major works of the expressionist painter Karl Schmidt-Rottluff. The fascinating history of the two oil paintings “Katholische Probsteikirche St. Patrokli, Soest” and “Dame mit Hut”, which were the focus of our last exhibition about the Brücke artist, received a particularly positive response from visitors and the press, which is why we are particularly pleased to be still able to present these two Expressionist jewels. 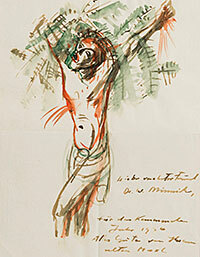 In addition, we show two watercolors by Karl Schmidt-Rottluff, which have recently arrived. Other new highlights of Classic Modernism in our gallery are currently works by Pierre Bonnard, Max Liebermann, Emil Nolde and Alexey von Jawlensky. Let yourself be surprised by our current hanging, which combines new entries with well-known works by Ernst Ludwig Kirchner, Christian Rohlfs, Karl Hofer, Arnold Balwé or Gerhard Richter. Look forward to our catalog for the year 2019, which will be published in mid-February. In this conversation participated Dr. Tanja Pirsig-Marshall, Deputy Director LW Museum für Kunst und Kultur in Münster and Christiane Remm, Curator of the Karl and Emy Schmidt-Rottluff Foundation in Berlin. The discussion was moderated by Dr. Sebastian Preuss, Deputy Editor-in-Chief of the magazines Weltkunst and Kunst und Auktionen, Berlin. At the center of the lively discussion were the two main works of the current special exhibition on Karl Schmidt-Rotluff, Katholische Probsteikirche St. Patrokli, Soest of 1921/1922 and Dame mit Hut, around 1921. 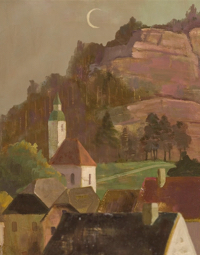 The panel of experts discussed the context of origin in Soest, which attracted many Expressionist artists thanks to its medieval city center and also inspired Karl Schmidt-Rottluff to many of his paintings. Another source of inspiration for the artist was his extensive collection of African works of art. Especially in the painting Dame mit Hut, the mask-like face immediately catches the eye. Ingrid Pérez de Laborda, the gallery’s art historian, subsequently talked about the jovial relationship between the previously unknown collector Franz Zöllner and the Brücke artist. 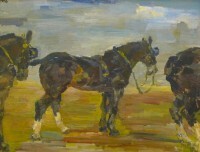 The round agreed that it was a real sensation that the two pictures are now available for the first time on the art market. Impressions of the opening matinee on occasion the panel discussion “Karl Schmidt-Rottluff – Artist. Just in time for the Munich Kulturherbst, we present the new acquisitions of the last year in our showrooms. We show an almost programmatic overview of our current gallery repertoire with exhibits of the usual outstanding quality and best provenance. Again in the program are paintings by Gabriele Münter, Paula Modersohn-Becker, Pablo Picasso and Arnold Balwé, about which you can find out more about leafing through our catalog. We would be happy to guide you personally through the exhibition, passing high-quality works of art by the most prominent artists of classical modernism. We look forward to your numerous coming! Take a unique journey into the world of art. The film juxtaposes the selected works in such a way that they tell an entirely new story. Individual figurative elements are ingeniously animated, thereby creating a new art form of moving images. The resulting illusion offers a fresh perspective on the masterpieces of the outstanding artists to whom we wanted to pay particular tribute. Prepare to be captivated by this visual experience. Painted in oil, the animated film was designed and developed by the production company Neukla web & film on behalf of Galerie Schüller. Directed and produced by Benedikt Klaus and Benedikt Neumann. Sound design by Özay Tekin. She was an open-minded artist who embraced experimentation; many of her accomplishments have lingered in obscurity because her oeuvre has generally been studied through the narrow lens of her life and her relationship with Kandinsky. That is why the focus of attention has been almost entirely on her pictures from the "Blue Rider" years. 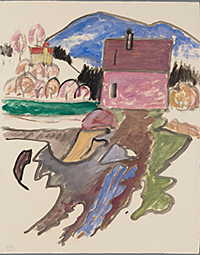 Art lovers usually associate Münter’s name with German Expressionism, with Murnau and her home in the picturesque small town, now a museum dedicated to her and Kandinsky’s work. 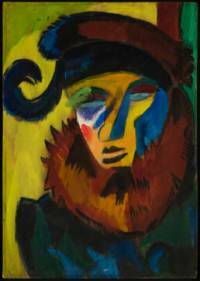 Yet Münter’s art was far more multifaceted, imaginative, and stylistically diverse than most people are aware. 'With the exhibition Max Pechstein. Künstler der Moderne the Bucerius Art Forum explores, from 20th May until 3rd September 2017, for the first time, the work of the German Expressionist in a solo exhibition in Hamburg. 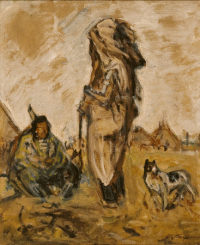 The exhibition recognizes the artist Max Pechstein (1881-1955) as a pioneering representative of modern art and brings to life his complex work against the background of various biographical and geographical points of focus.' The solo exhibition is described in these words on the website of the Brucerius Kunst Forum Hamburg. Galerie Schüller is also hosting treasures by this artist: Fischerhafen auf Fehmarn (Fishing Harbour on Fehmarn), a late work dated 1953 and Corpus Christi a watercolour, painted by Max Pechstein in 1936 and given as a gift to his personal physician Dr. W. Minnich. 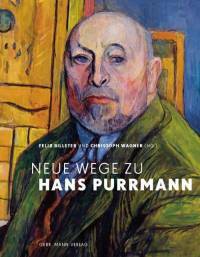 Over the course of his artistic career, Hans Purrmann (1880-1966) developed into one of the most important colorists of the 20th Century. In this new book, renowned authors discuss new research into his life and work, presenting a contemporary overview of all of the phases of the artist's life and career.